213 pp. At the time of this review (6/12/17), it holds a 4-star review on Barnes & Noble, with only four reviews, and a 4.3-star review on Amazon with 720 reviews. Book Obtained By: Author give-away at COFW meeting, November, 2016. “To build a future, sometimes you have to tear down the past…. “Chicago event planner Libby Hamilton can turn any bland setting into a dramatic venue—but when she abruptly loses her job, and her fair-weather boyfriend moves to another state, Libby suddenly finds herself back in the tiny town she grew up in. Worse than that, her father wants help transforming an old schoolhouse into a vintage ice cream parlor and Libby must trade in her power suits for power tools. Tracy Brogan presented a fall 2016 program to Central Ohio Fiction Writers, my local chapter of Romance Writers of America. She’d brought a number of extra copies of her books, including ones in foreign translations. She donated them to the club! New to romance writing, and not yet having decided if I was joining COFW back then (I joined at the end of December, 2016), I hung back until the other members made their selections. This was one of the books Brogan talked about. She said she imagined what the worst possible way for characters to meet was. She described how Libby had been bicycling; squatting behind a dumpster is involved; and then Tom appears. If you’re going to meet like that, I knew this character needed both a sense of humor and a backbone. She has both, always feeling realistic. Characters build depth as the story progress. Cast of characters supports the novel and adds subplots to keep me ever hooked as to what’s happening next. The Hamilton family members lead an interesting life. Brogan didn’t head hop: Libby and Tom are the only points of view, and I never wondered when she made a switch: either she did it at chapter breaks or as section breaks, and within one sentence I knew whose point of view I was in. Distinct voices for the characters. Puts me through the range of emotions—one page I’m laughing at the dynamics of the Hamilton family, the next I’m teary-eyed, later I’m crying outright, and later I’m blushing at the romance. I don’t always need an “alpha” hero. I like the wholesome guy next door, and that’s emotionally wounded Tom. While I KNOW a romance typically ends happily, Brogan never gave me that certainty. Set in a small town that seems to be recovering from harder times, the setup felt authentic as I pictured smaller towns I’ve bicycled through. Hope or despair, the buildings and the people I meet show me where they stand, and Brogan did the same as she painted Monroe. Even if some of the events in the book seemed totally outlandish, because I’d bought into the Hamilton family as people (think your most dysfunctional Thanksgiving dinner, then see how yours stacks up to one of their dinners, then ultimately their Thanksgiving dinner), I believed the happenings. From cantankerous “Nana” (the grandmother) to Libby’s opinionated two sisters (both with their subplots, and all 3 have delightfully historical names), her father’s life-changing decision to buy the historic building to turn it into an ice cream parlor, and to her mother, long-suffering from her husband’s spontaneous decisions, I believed in this family. Tom serves as a great contrast for Libby. She’s talkative, into bigger gatherings and organizing things, while he’s reserved, focused on the specific tasks of restoration, and determined to keep their relationship professional. Give it time, though, and watch the magic happen between them. In chapter twenty, if you’re not crying happy tears, you’ve got a better grip on your emotions than I do. Yup, I invested in most of the characters. At the end of the novel, when Brogan tied off those sub-plots, she sucker punched me, but I had to forgive her. That raised the stakes, leaving me wondering still more, was she really letting Libby secure a happy ending? I’ll definitely grab another Tracy Brogan book down the line. So many books, so little time! Take this book along with you to the beach, read it while waiting in line at a store, or curl up in a comfy chair and settle in. At 213 pages, it’s a fast, fun read. I can’t speak to the audiobook version, but one reviewer wasn’t a fan of the artist chosen for that reading. What do you like best about romances? 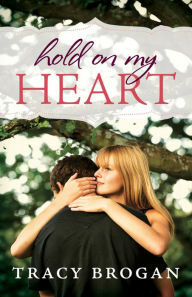 If you’ve read Hold on my Heart, what did you think? This entry was posted in Book Reviews, Uncategorized and tagged Book Blogger, Book Review, Contemporary Romance, Tracy Brogan. Bookmark the permalink.